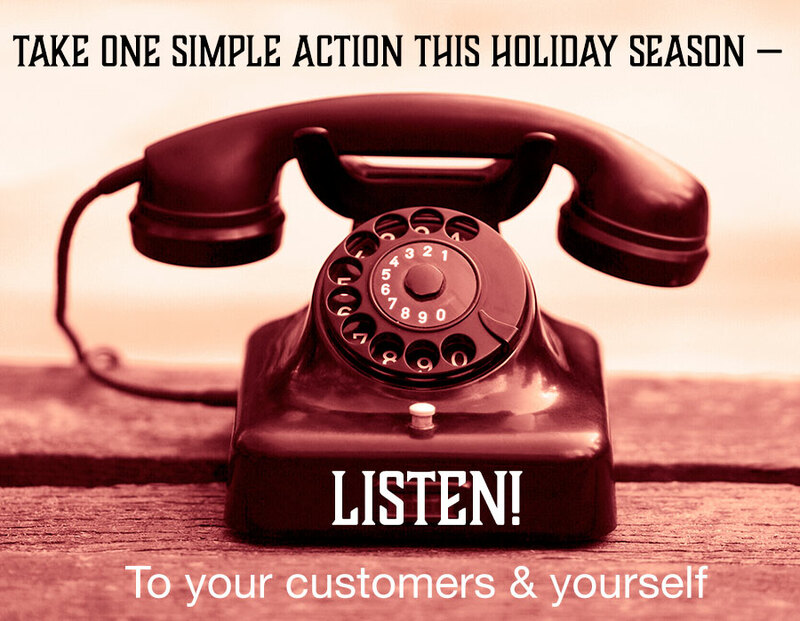 Even though we are incredibly busy during the Holiday Season, we can take a simple action to make out lives — and our business — better in the future by listening and taking note. Since I’m sure you are as busy as I’m at this time of year — if not more so — I’ll keep this brief. The number one comment I hear this time of year is “I really feel I should be doing something to prepare for next year, I want next year to be better. But I don’t have time!” I understand completely. But your busiest time is some of the best time to listen to your customers or clients — as well as yourself — and take notes. Simply pay attention to what people say, ask or complain about, praise and make simple note of it someplace. Doesn’t need to be complex, lengthy, or complete. Simply note that a number of people mentioned they now prefer Instagram to Facebook (data nerds (naming no names, Carolyn), or a number of clients asked about website security, or all of your red earth-tone products sold, but the lime green is languishing. Simply make note of anything that strikes you, anything you question, anything that seems a pattern out of the ordinary. Even something as mundane and how often you run out change and have to make an “emergency” dash for more (and what kind). At this point, simply take note. Analysis can wait until you have more time. Also, take note of the times you feel joy, anger, frustration, accomplishment, happiness and so forth in what you are doing. What are you feeling & when. Again, simply take note. Analysis can come later when the pressure is off. Later you can look at what makes you feel a greater joy in life and sense of achievement versus what makes you feel negative stress and drains your pleasure in life. And now for something completely different, to borrow from Monty Python. Some of you may know that I took a life-changing course on behavioral economics through Coursera a couple of years ago. The Coursera.org courses are largely free, though you can now get a certificate of completion (and in some cases college credit) for a nominal fee (US$49). Some you can take entirely on your own time, others you can participate in real-time with others throughout the world. No matter what your interest or need, there is sure to be something to tempt you.